The following is a review of how Atlanta Advisory will approach the sale of your business. Our initial meeting is an opportunity for us to get to know each other and see if we would work well together. 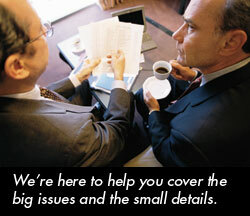 We understand that selling your business is a major decision and that confidentiality is critical. As a result, we will provide you with a signed Broker’s Confidentiality Agreement. We want to learn about your company and why you are interested in selling, and you need to learn about us. Our comfort level with each other will be the basis for going forward and developing a good working relationship. If our initial meeting is going well, we would like to have a short tour of your company to get a sense of how the business operates. Next, we would need a quick review of your financial statements to evaluate your profitability. If at the end of this meeting you are comfortable with us and we are comfortable with you and your company, we can agree on moving to the next stage of our business relationship. The following is an outline of the process. Gather Information. With your help, we collect, record, and analyze all the pertinent information about your company in our Confidential Business Questionnaire. It’s a clear and useful format and is the basis for preparing formal documents. It is critical that you understand that selling your business requires a lot of input from you. We need to know and understand your business, and we depend on you to provide the information. We will need at least 3 years of financial information including your P&L’s or Income Statements, Balance Sheets, and Corporate Tax returns. Some other things that we will need include: information on your corporate history, your products and services, your employees, the assets included in the sale, your lease, your competition and the reason you are selling your business. We put it all together but only you can provide the company information. Financial Review. We will recast the income statements from your company to adjust for the fair market value of your business assets and to add back discretionary business expenses. This will give us a clear picture of the true cash flow of your business. We work with you to identify all your current business expenses that could be considered not necessary business operating expenses and become income for a new owner. This is a critical step that is required to be able to validate the highest possible price for your business. Privately owned companies are usually sold based on a multiple of the Owners Discretionary Income that will be available for a new owner after the sale. We will do an analysis of your company to support the highest multiple and get the most for your company. Market Valuation Analysis. We will do an analysis and opinion of the range of value we believe your company will sell for. Our experience and access to historic market data for comparable business sales allows us to be very good at determining the value of your company. It will be the basis and justification for the business purchase price for both potential buyers and lenders. Since we get paid a commission when we sell your business, we are very motivated to get the highest possible price for your company. Optionally, we can co-ordinate the completion of an Independent Third-Party Business Valuation for your company. This would be done by an independent valuation company. This service has an upfront cost of $2,000 to $5,000 depending on the size and complexity of your business. There are several very qualified and competent valuation companies that we work with that do credible valuations. Agreement to sell your business. Based on the Market Valuation Analysis (if done) or by our own review and analysis of your business, we will decide on the specifics of price, terms and conditions that are appropriate for the sale of your company, and we will complete a formal Listing Agreement for AccuBrokers, Inc. to confidentially market, qualify and negotiate with potential buyers and sell your business. In most all cases, the agreement is a 12-month exclusive right to sell contract. Professional Documentation. We will prepare a sophisticated and comprehensive Confidential Memorandum to enhance the presentation of your business to potential buyers. This document will be the compilation of all the information that we have collected about your company and will be the starting point for working with potential qualified buyers. It will include an Owner’s Justification for Purchase Price where we support the validity of the asking price with a realistic review of the numbers. Generic Blind Profile. We will create a generic Business Profile for your business as the basis of promoting your company while we maintain your confidentiality. All marketing and promotion activities are conducted in a manner that protects your company’s identity but generates interest in your opportunity. Marketing and Promotion. Through our Networking, we are connected to thousands of qualified buyers that are actively looking for business opportunities. We “co-broker” with other brokers both locally and nationally to enhance the process of selling your business. We will generically list your company on a variety of other professional web based “business for sale” sites. We have a large database of active buyers including high net worth individuals, business owners and Private Equity Groups. We will also pursue other marketing efforts such as targeted direct mailings, and advertising in local, trade and national newspapers and publications including The Wall Street Journal. We will work with you to determine additional activities that will enhance the sale of your business. Business, Marketing and Sales Advice. After a careful review of your business and in conjunction with your expertise, we will determine the things that would be prudent for you to do or change to prepare your business for sale. We will determine the areas that may mean new potential or opportunity for a buyer or ways that a new buyer may change, grow or expand your business. We will help you identify and address issues related to your inventory, management structure, business assets, pending litigation, environmental concerns and the appearance of your physical plant that can have an impact on the sale of your business. We will also discuss the various ways to structure the sale of your business. Such things as terms and owner financing will have an enormous impact on the success that you will have in selling your business. You need to focus on running your business as profitably as possible, while we focus on selling it. Pre-Qualify Potential Buyers. We will identify interested buyers and determine their qualifications to pursue your business opportunity. We will have them sign our Buyers Confidentiality Agreement before we will provide any specific information for them to review regarding your business. We will have them complete a Buyers Profile or resume and provide a confidential Personal or Corporate Financial Statement. Bring Buyers and Sellers Together. We will review your company with the interested qualified buyers and answer all relevant questions. After determining a potential good fit, we will discuss the interested buyer with you and arrange for the potential buyer to meet with you and have a tour of your business and discuss your opportunity. This is your chance to present your business and discuss its potential with a qualified buyer. Getting an Offer. If all goes well and you are comfortable with the buyer and the buyer is interested in your business, we will encourage the buyer to submit a Letter of Intent or an Offer to Purchase to buy your company. We will work with and provide information to potential buyers on how to make a serious offer. Acceptance of an Offer. You will accept, reject or counter any offers that you receive. We will help you review and negotiate any offers and assist you in preparing counter offers until a deal is acceptable. Once you and the buyer have agreed to all the terms and conditions of the sale, you will formally accept the offer. Due-Diligence. Once you accept the negotiated formal Letter of Intent or Offer to Purchase your business, the buyer will be given a scheduled “due-diligence” time to further examine your company with access to all business and financial information. This is the buyers’ opportunity to confirm that all information regarding your business is accurate. At the same time, a closing date for the sale and transfer of your business will be established. Closing the Sale. To protect both the seller and the buyer, closing the transaction will require careful preparation of all necessary documents. We will co-ordinate bringing together all the professionals necessary to close on the sale of your business. We have a network of qualified closing attorneys who specialize in business transfers that we can recommend handle the legal sale of your business. They will save you money on closing costs, and you can be confident that your sale will be handled properly. Start the next chapter in your life.